I've always thought eggs Benedict was the perfect brunch dish. Not only is it delicious, it also looks elegant: a toasted English muffin topped with Canadian bacon, poached egg and a dollop of Hollandaise sauce. As much as I like eggs Benedict, it wasn't something I wanted to fix at home, especially for a lot of people. Poaching all those eggs wasn't something I wanted to do! A couple of years ago, I found a recipe in the newspaper that lets me serve eggs Benedict without poaching a single egg! Eggs Benedict Casserole uses the same basic ingredients as eggs Benedict, but they're not used in the same way. 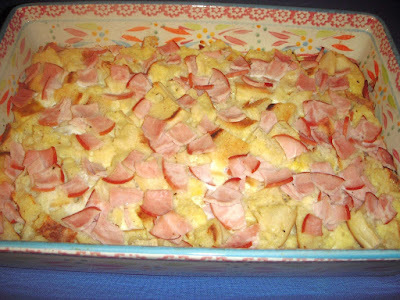 The casserole starts by cutting the Canadian bacon into pieces and placing half of them in the bottom of a 13 x 9 x 2-inch baking dish. cut into 1-inch pieces and placed on top of the Canadian bacon. The remaining Canadian bacon is sprinkled on top of the English muffins. Eggs are whisked with milk -- it helps bind the casserole -- salt and pepper and poured over the ingredients in the baking dish. Although salt and pepper aren't used in traditional eggs Benedict, they enhance the flavor of the casserole. Cover the baking dish and refrigerate overnight. My experience has been the longer the casserole is refrigerated, the softer the finished product. Since my family prefers a firmer texture, I refrigerate it a minimum of four hours and no more than six. Remove the baking dish from the refrigerator 30 minutes before baking and let it sit at room temperature. Cover the baking dish with foil and bake for 35 minutes. Remove the foil and continue baking until a knife inserted in the center comes out clean, about 10 to 15 minutes. Traditionally, Hollandaise -- a rich sauce made with butter, egg yolks and lemon juice -- is spooned over each serving. You can make Hollandaise from scratch or, what I do, use two packages of Hollandaise sauce mix. If I'm making the casserole for a bunch, I fix both packages of sauce. If I'm only cooking for the three of us, I fix one package the day I make the casserole and the other when I reheat the leftovers. Instead of pouring the Hollandaise over the casserole, I serve it separately so people can take as much or as little as they want. The next time you need brunch for a a bunch, whip up a batch of Eggs Benedict Casserole. Add some grits or Potatoes O'Brien, a fruit salad and some muffins and you've got a meal that won't break the bank! Place half the Canadian bacon in a greased 13 x 9 x 2-inch baking dish. Sprinkle the English muffin pieces into the baking dish and top with the remaining Canadian bacon. Whisk the eggs, milk, salt and pepper together and pour over the ingredients in the baking dish. Cover and refrigerate overnight or a minimum of four hours. Remove the baking dish from the refrigerator 30 minutes before baking and let it sit at room temperature. Cover the dish with foil and bake at 375° for 35 minutes. Uncover and continue baking until a knife inserted in the center comes out clean, about 10 to 15 minutes. Prepare the Hollandaise sauce according to the package directions. Serve with the casserole. Hi Margaret. This is a great way to make Eggs Benedict. It looks yummy. Thanks for entering it into Our Little Family Adventure's Iron Chef Brunch Cook Off. Readers will vote for their favorite recipes on our Facebook page. This is a wonderful idea. I can't wait to make this. Thanks,for sharing at What'd You Do This Weekend. You're welcome, Linda. Thank you for the opportunity to share the recipe on your linky party! Since I'm pretty much a klutz when it comes to poaching eggs, I don't want to poach a bunch of eggs for a bunch of people either! This is a great idea for a crowd. Thank you for sharing, Margaret. So delicious and easy to prepare! Coming from MELT IN YOUR MOUTH Blog Hop ! Come-by my blog and say Hi! Congratulations!! Your recipe has been featured at Tasty Tuesdays 50 on my blog, Lori’s Culinary Creations. Hop on over and grab a feature button and link up your latest culinary creations. Congrats again. Wow! Thanks for featuring the recipe on your blog hop, Lori! I've added the featured button to the bottom of my page.